I tried some really good ones. And some really not good ones. The one thing they all had in common, though, is that they all lacked a substantial amount of fiber. And if you know me, you know there’s one thing I value as much, if not more, than I value protein and that’s FIBER. Fiber keeps you feeling fuller longer, it lowers cholesterol, helps manage blood sugar levels, helps you “go” potty better and easier, and perhaps my favorite benefit — fiber functions as prebiotic fuel for a healthy gut. (Be sure to listen to The Probiotics & Prebiotics Episode). 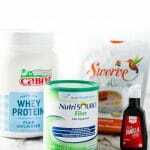 Sure, there are protein powders that SAY they contain fiber. But seriously… 3 grams? Pssshhh… not even worth my time to scoop that out. So when fellow dietitian Tanya Zuckerbrot recently launched her F-Factor 20/20 Protein Powder (the 20/20 stands for 20 g protein and 20 g fiber), I was super intrigued. I watched on Instagram as thousands of her fans posted pictures of yummy looking protein-packed, fiber-filled recipes, all made with her 20/20 protein powder. As a result, I quickly developed a serious case of fiber-FOMO and decided to purchase a bag of the 20/20 vanilla powder myself to give it a try. …and I immediately understood the hype. 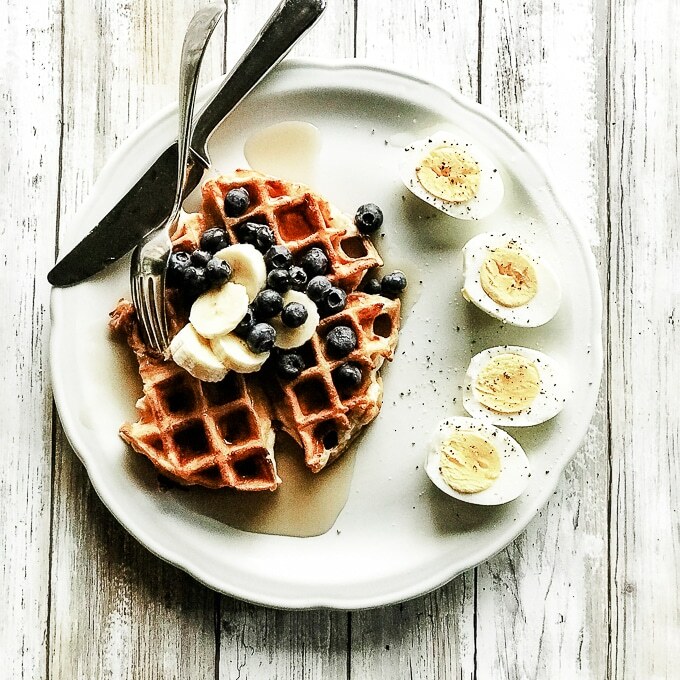 One serving made 3 VERY filling waffles that boasted more than 25 grams of protein and 22 grams of fiber just simply from using the 20/20 protein powder. I was so blown away with how good the structure of these waffles turned out, that I immediately grabbed a different brand of protein powder out of my pantry to see if these “magic waffles” could be recreated with another powder. I quickly learned they could not. There was something special about all of the fiber in the 20/20 powder (it’s actually “hydrolyzed guar gum,” which is NOT the same a “guar gum”) that gave the powder enough structure to yield the perfect protein waffle. There was only one problem. The monk fruit sweetener used in the powder was NOT to my liking. And so, my quest continued. And so, I spent the last couple of months weighing and measuring to get just the right ratio of whey, fiber and erythritol (my preferred non-nutritive sweetener) to come up with my own Homemade High-Fiber Protein Powder recipe. And today, I’m sharing it with you. At $2.32/per serving, it’s an affordable way to boost both the protein in your diet and the fiber as well. 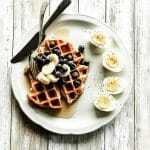 While I’ve become a fan of using the one-serving recipe for the homemade high-fiber protein powder listed below in waffles, rest assured you can also use it anywhere you’d normally use protein powder, including in your favorite smoothie recipes. I added erythritol to the high-fiber protein powder recipe to sweeten up the powder enough such that you could simply mix it with water or milk and have a basic high-fiber protein smoothie. But if you wanted to use the powder in a recipe that called for additional sweetener, you could probably omit it. It’s really just a taste preference. It’s also worth mentioning that I’ve been asked by more than one person if you could use another fiber in place of the hydrolyzed guar gum and the honest answer is, I dunno. I’m not sure you’d get the same structure to make things like waffles, pancakes, etc., OR that a different fiber in this amount would be as tolerable on the GI system. My personal opinion is if this works, why mess with success? 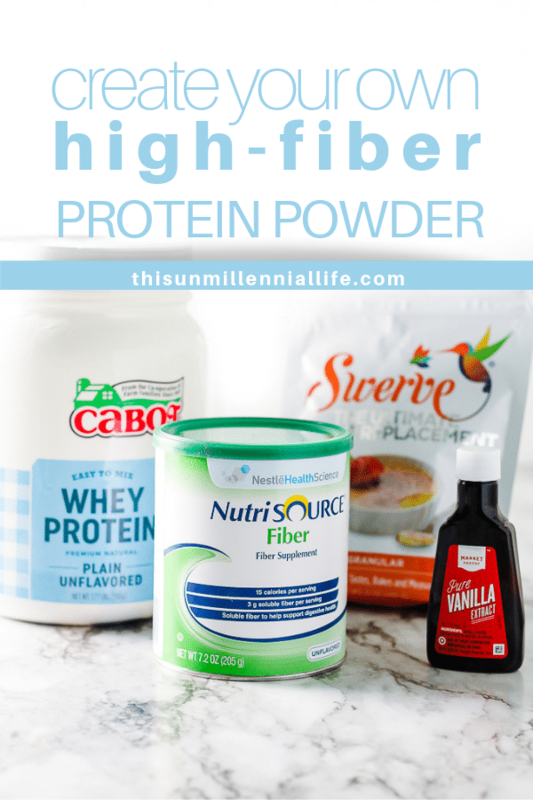 After years of searching for the perfect protein powder, I finally created my own Homemade High-Fiber Protein Powder using this surprisingly simple recipe. Combine dry ingredients (whey, hydrolyzed guar gum and erythritol). When ready to prepare a smoothie, protein waffle/pancakes, etc., add vanilla extract for flavoring, if desired. *NOTE: Hydrolyzed guar gum and guar gum are NOT the same. Using “guar gum” (i.e. not labeled as hydrolyzed) will not yield the same results and may result in gastrointestinal distress. I recommend using the Nestle NutriSource Fiber Supplement as it’s the only fiber source I’ve tested with good results. Whisk together high-fiber protein powder and baking powder. Add liquid egg whites and whisk until smooth. Whisk in water if mixture is too thick. Let stand a minute to thicken while waffle maker preheats. Repeat with remaining batter. Serve waffles warm with syrup.